May was a beautiful flower month in caparison to June, the poopy flower month. 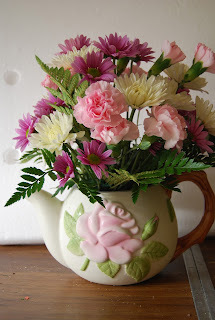 In May for Mother's Day the Freedom Petals volunteers created colorful tea pot arrangements. In June we threw away so many flowers that were donated, it was so hot, there were no flower holidays, so a request for flowers went out to our volunteers and when you ask He does giveth. May had 20 volunteers working in the garage creating flower bouquets and they made 60 beautiful corsages for mothers day as well. June had 12 very aggressive volunteers (cutting into graduation and vacations now) they brought 2 or 3 bouquets and flowers from their gardens for our event. Thank you! Thank you! Because of the heat we worked in the very cool basement. In May we had a surprise visit from Kris S. from South Carolina and in June we had a surprise visit from Lori from Illinois (she is a florist and made our reception desk baskets). Our deliveries for both months were a huge success. 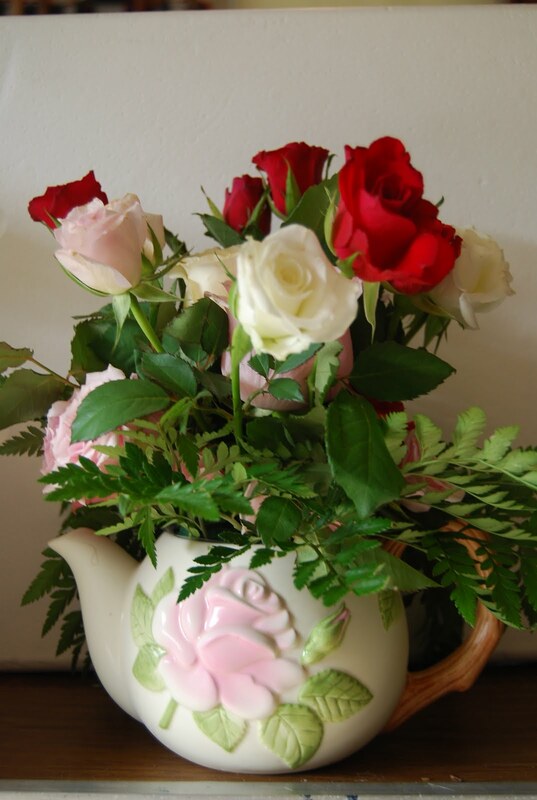 Everyone loves our flowers and they bring such healing and joy to our wounded warriors and their families. In May the tea pots adorned the Nurses stations and the visiting children enjoyed the corsages. In June we made 24 bud vases that brought color to the Mologne House cafeteria. Every table received an arrangement for someone to take home. Thank you to all who brought your talents and help with the May and June events. Thanks for all the vases that continue to show up and also the vases from the Fort Myers Thrift Store. Thanks to the Lions Clubs, Women's Groups and various donations we have received in 2011. My next goal is to install a utility sink in the basement. No more trudging up and down the steps with water buckets.